5 Year Printer Warranty - Don't pay for repairs. 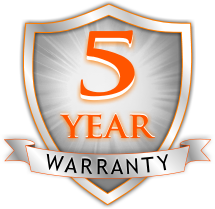 5 Year Label Warranty - They'll actually last longer! SafetyPro industrial label printers are warrantied to be free from defects in materials or workmanship for a period of five (5) years from the date of purchase. Within this period, Industrial Safety Solutions, Inc. will, at its sole option, repair or replace any components which fail in normal use. Such repair or replacement will be made at no charge to the purchaser for parts or labor. This warranty expressly excludes loss, or damages from accident, misuse, modification, neglect, or careless handling. With all warranty repairs, Industrial Safety Solutions, Inc. guarantees the repair for 90 days, or to the end of the original warranty, whichever is longer. Industrial Safety Solutions retains the exclusive right within all warranty periods to repair or replace at its sole discretion. Attempting repairs or replacements, or having repairs or replacements done by a 3rd party may void your warranty. by the warranty. Consumable or expendable items or parts such as label supply and ribbon are not covered by this warranty. The warranties and remedies contained herein are exclusive and in lieu of all other warranties whether express or implied, including any liability arising under any warranty of merchantability or fitness for a particular purpose, statutory or otherwise. This warranty gives the purchaser specific legal rights, which may vary from state to state. In no event shall Industrial Safety Solutions be liable for any incidental, special, indirect or consequential damages, whether resulting from the use, misuse or inability to use the product for any reason including defect. Some states do not allow the exclusion of incidental or consequential damages, so the above limitation may not apply. We are absolutely confident that our SafetyPro Vinyl Label Stock will get the job done right, and last over the long haul. If labels made with SafetyPro Vinyl fail under normal conditions within five years of purchase, we will provide a one-time replacement roll of the same supply. Now not only your printer is covered by warranty, but even the labels and signs you make are covered. they also endure the rigorous and ongoing real-world test. If a material does not pass our tests, it is reformulated and replaced. Because we only sell the highest quality materials, and can guarantee it, we are confident to be offering this industry leading warranty. The supply warranty applies to SafetyPro Vinyl Label Stock, our most popular continuous supply used for pipe marking, rack and bin labeling, safety signs, arc flash labeling, 5S labeling and OSHA required labels. What are you waiting for? 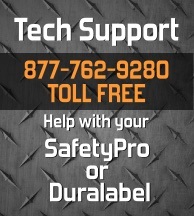 SafetyPro beats the competition hands-down in every area, including warranty. Call 877-762-9280 today to see what we can do for you.